It might be a Texas thing, but there is just something so comforting about ribs fresh off the grill! Preheat the grill. Set the rack of ribs on large platter or baking sheet. In a small mixing bowl, combine the chili powder, ground cumin, smoked paprika, salt and pepper. Coat the rack of ribs with the homemade rub. Brush 1 cup of BBQ sauce onto the ribs. Place on the grill over indirect low heat and close the lid and cook for 1 hour. With about 10 minutes left, brush the other 1 cup of BBQ sauce onto the ribs. 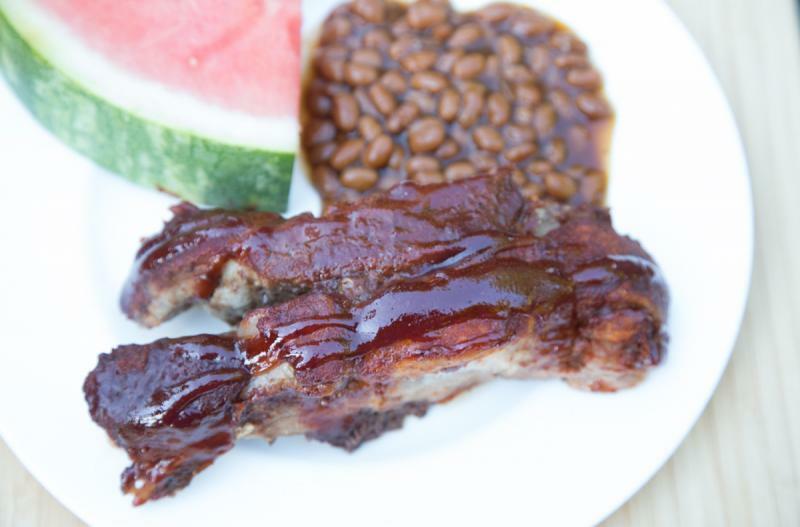 Serve BBQ Ribs with baked beans and corn. In a small mixing bowl, combine 2 Tbsp chili powder, 2 Tbsp ground cumin, 2 Tbsp smoked paprika, 2 tsp salt and 2 tsp pepper. Coat each rack of ribs with the homemade rub. Brush 1 cup of BBQ sauce onto each rack of ribs. Put baggie in the freezer and freeze up to 6 months in fridge freezer or 12 months in a deep freezer. 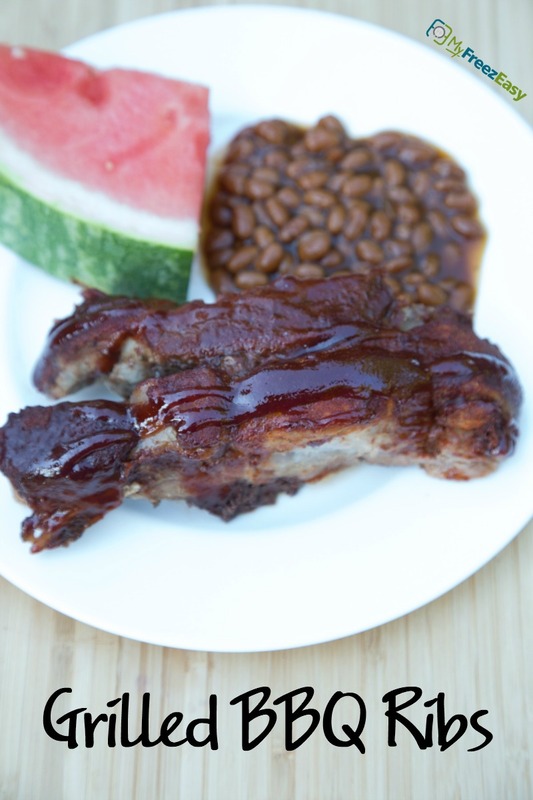 Thaw ribs completely in the fridge overnight, or a warm bowl of water for about 20 minutes, before grilling. Because a rack of ribs is large and awkward to freeze, you could cut them into smaller pieces and use gallon size baggies. You could purchase the ziploc 2 gallon or larger baggies. (Most grocery stores don’t carry these, but you could get them from Amazon or online.) You could wrap the ribs and rub (not the sauce) in plastic wrap and then foil and freeze that way, then brush the BBQ on just before grilling. Thaw ribs completely before grilling for over indirect low heat for 1 hour. Brush another 1 cup BBQ sauce onto ribs with 10 minutes of grilling left. Serve with baked beans and corn on the cob.